As I walked anonymously through the port I was bewildered by the energy and variety of the place and wondered at my naivety for having believed myself to be the first person to set foot on these shores […] I amounted to no more than they did now, yet somehow I felt liberated by my bankruptcy. I was a nobody with nothing to prove, free to explore this other country which was no longer my responsibility but simply something new to be perceived. We find ourselves thrown into a baffling, raucous scene: a congested walkway hemmed in by a wooden landing stage, an imposing warehouse, and a mean-looking security enclosure processing incomers. Beyond this liminal zone choked with milling tourists lies a small plaza dominated by the façade of a fancy hotel and surveyed by predatory eateries. The crowd is a perplexity of eccentric characters, some rendered with great dynamism in industrious mid-stride, others rooted to the spot as if lost in thought and indifferent to those around them engaged in spirited commercial, social, and amorous encounters and altercations. Animal forms both familiar (scrawny rogue mutts) and unprecedented (cloven-hoofed duck-billed chimerae) weave their way through an undergrowth of limbs, or skulk ruefully in shadow. Some of the figures are filled-out, palpable with highly modelled detail, others barely adumbrated by long serpentine contours, translucent and ghostlike, transpierced by the wireframe outlines of the buildings that gird the quayside. Around them hover the spectres of erased precursors and lines of perspective projection; above, the half-suggestion of vistas lying far beyond the immediate quarter. Here and there, in the midst of the general brouhaha, delineations become frayed and wane into patches of dimensionless blank space that vibrate with undiscovered detail. Though hard-fought, intricate, and textured, the drawing does not have the air of a study or sketch for some ulterior work that would fill out the scene and fix it into a final authoritative form. It is more like an accidental snapshot, probably from the point of view of one of those overexcited travellers we see in an accompanying picture straining from the prow of an ocean liner as it approaches the ramshackle jetty, their smartphones held aloft, filing anticipatory souvenirs before coming ashore to be stung for trinkets and curios. This is one of the products of the imagination contributing to the continued construction and portrayal of the world of The Islanders. As well as written accounts by one possibly unreliable witness,2 this world is documented through two species of works: drawings which place a set of entities and characters in situations endowed with a careful internal coherence; and three-dimensional renderings of the same entities which appear more autonomous, but which we invariably encounter again in the drawings, in medias res. 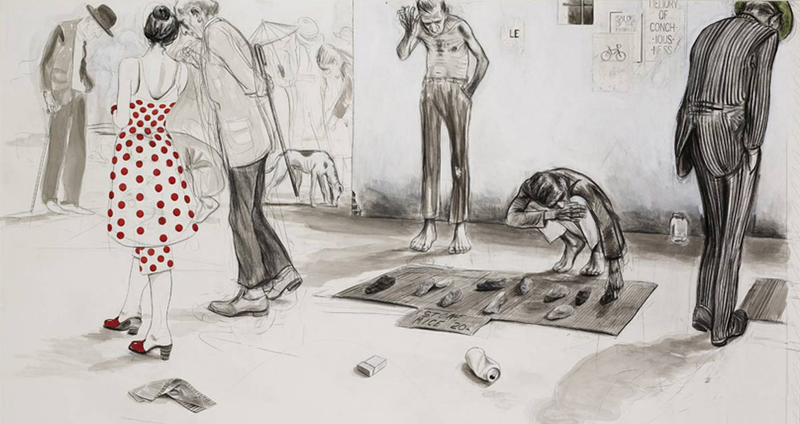 Each work deliberately corrodes its self-sufficiency by referring laterally to its counterparts, their shared characteristic being that they mean something only in the context of a whole, albeit one that is perennially incomplete. The notion that it is ‘essential to things that they should be possible constituents of states of affairs’ is a demand of worldcraft that was one of the starting points for the Islanders project: it provided an answer to the question of the continued motivation for and meaning of artmaking, a way out of the unsatisfactory predicament of simply making one piece after another without any idea of what they might be pieces of. A definitive answer to this last question usually comes only after the artist’s demise brings closure to the oeuvre (the catalogue raisonné, the ordering of works biographically or art-historically—if they are lucky). While it is impossible to second guess the contingencies of interpretation, The Islanders announces a structural principle that will be difficult to circumvent in any future evaluation—the speculative totality of The Islanders is, at the very least, a constitutive part of what any one piece of it means. The approach can be described as one of bounded openness: although the enterprise of fabricating this world is a contract made by the artist with himself, the work is thereby invested with a totalising ambition that is patently unrealizable (the depiction of ‘all that is the case’). Nonetheless, it is binding: objects and drawings can and will be dispersed, relocated, exhibited, bought and sold, without renouncing their lateral bond to a whole that is produced alongside the parts as another part; one that is constantly thematised in the artist’s descriptions of and in The Islanders. This enterprise is quite unlike those of the innumerable manufactured worlds of contemporary reality, such as the precision-rendered virtual models of videogames, where every last corner can be explored at will, but where subjective experience is corralled and limited by a saturated set of data. What we encounter in The Islanders, in each drawing as in the whole, is a coherent, vividly textured patchwork of fragments on a ground whose vast indeterminacy remains a reservoir of possibility and imagination constrained loosely by what we have encountered thus far. Even the set of all the works would present but a partial aspect of that which the project is in the process of meaning; so this meaning-as-a-whole is both circumscribed in advance and yet remains in the future, yet to be discovered. In making this contract with himself, the artist also invites the viewer to sign up, to participate in constructing the Island. Everyone who comes here comes from the outside. But from the Island’s point of view, the outside is a part of the Island. Equally, The Islanders is a part of our world (the world from whose vantage point we view its artefacts). It is also a picture of everything—or more precisely, a picture of the many everything-pictures our intellectual history has bequeathed us. For the various cultures of the Island read like fictionalised versions of the many philosophical schemas that have, at various points, claimed to encompass and resolve reality as a whole. These conceptual references are unmistakeable, yet too dense and too tangled to resolve into neat allegory. A philosopher could drive himself mad trying to do so. This notional philosopher would however discover one remarkable thing: if The Islanders is intended as a representation of the realm of abstract thought, it is a peculiarly pacific one. Ideas which have for millenia been at stake in philosophy’s constant internecine strife, the object of endless polemics, stringent programmes for reform, revolution, overturning, and undermining, decisions which have birthed powerful ideologies and provoked bitter quarrels, are perennial and placid features of the landscape within the shores of the Island. The paradoxical coexistence of their contesting claims seems to give its inhabitants not the slightest cause for concern. As far as we know, disputes between factions rarely escalate beyond the occasional street brawl. As we are told, on any question to which there are two mutually exclusive answers, the islanders are divided exactly down the middle, making for a peculiar equilibrium that forestalls the hostilities of ideological struggle. Thus, pleasure-seekers pass by the abstruse proclamations plastered on the four-storey Penrose warehouse as if they were advertisements for a series of entertaining diversions (which, indeed, some of them seem to be). The Free Church of Logical Positivity takes no umbrage at the goings-on in the neighbouring Laissez Faire hotel, whose lascivious guests are obviously not there for the sea view. Theological disputations, rather than a casus belli, are slogans for T-shirts hawked in the marketplace; existential quandaries become trading names for dubious dives where tenants of the most incompossible creeds drink each other under the table; and pensive dandies flamboyantly express their conceptual allegiances by donning enigmatic geometrical fascinators. Disinterested in assessing their claims in the light of objective truth, the islanders seem to take for granted the coexistence of so many ways of cutting up, dividing, and dissecting the world only so as to reassemble it from its supposedly primordial parts once again. It is only the figure of the hunter, hero and/or fool of the piece, who stands resolute in positing the existence, at the heart of the island, beyond the bleak steppes, of that quarry known as the Noumenon, the ultimate reality against which such diverse worldviews might be judged. The hunter attempts to decode his surroundings, to record and map the Island; he hypothesizes, undertakes perilous forays and gallant missions to the dark interior. Yet despite the role it has played in the history of the Island, this heroic tradition of the hunting of the Noumenon itself seems ultimately a matter of romantic passion, with not even the hunters themselves harbouring any serious expectations of success. In short, while the texture and tenor of philosophies are brought to life in an extraordinary way in The Islanders, the agonistic and sometimes ill-humoured fixation of the philosopher is quelled, since the notion that one could gauge these differing conceptions against some ulterior reality is something the islanders barely entertain. Yet it was an originary violence that founded this island culture: consider the fate of the If’en, the indigenous inhabitants of the island, inseparate beings of perception and perceptibility, evanescent existences evading all definition. Colonised by Trianglelanders, through extermination, selection, and interbreeding they were sifted into fixed, determinate, and familiar forms. The very possibility of a world comes about through these trenchant gestures, and yet within it something of the If’en’s unconfined vision abides: the creole culture into which The Islanders plunges us embraces both the infinite flux of possibility and the drive to nominate, acquire, organize, and structure. Accordingly, one would be just as mistaken in taking the island as a work of mere whimsical imagination as one would be in assuming that these incarnations of the paradoxes of thought are just passive transcriptions of formal structures. If scenes from The Islanders invite an allegorical reading, at the same time they invariably obstruct any final determination by fusing those arid cogitations with the sinews of a singular personal history and mode of expression, and by leaving adequate space between the lines of the ‘facts’ for the viewer to draw their own maps. For all of these reasons, no simple relation of denotation, no ‘picture theory,’ can account for the negotiations that are underway here. The Port of Onomatopoeia functions to dramatize the operations through which The Islanders endures and expands. Onomatopoeia, in its modern sense, is the place where meaning and materiality coincide—in nonsense-rhyme, the crossing-point where the reader experiences the breakdown of sense into sound and learns to eat words (to ‘chew with the goo-goose,’ as Dr Seuss’s trickster-fox puts it). It is a place of transmutation and slippage where foreign tongues meet, the mouth through which the trade between meaning and matter passes. Nearer its etymological root, onomat-poios is the ‘place of name-making,’ site of the arbitrary binding of word to thing. Within the Islanders mythos, the Port of Onomatopoeia is where commerce with outsiders sees artefacts extracted from the native element of the Islanders (philosophical thinking suspended from its obsessive truth-claims) and offered up as commodities for daytrippers who will denature them by naming them, fixing and defining their meaning. With the artistic meaning and value of any particular piece being bound to the whole, there is no suggestion that this traffic should detract from the artist’s endeavour. 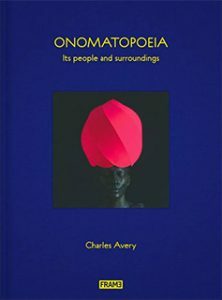 While much contemporary art appears to be locked into a perpetual and futile struggle to disavow or subvert its relation to the market, in The Islanders the port of Onomatopoeia stands as a vindication of its crucial role, marking it within the work itself and demonstrating that the process of artmaking need not be defended against its supposed contamination. Having disembarked at this strange harbour, one can be either a sightseer, leaving with selective memories, images, facts and artefacts; or a hunter, a vaguely ridiculous character who seeks something behind the bustling façade of the port, the marketplace, the bars and the tourist traps, beyond ‘all that is the case’; and who thus joins the artist in his impossible endeavour and becomes an Islander. (Both roles are indispensable.) Quite apart from what any one work means—that which is denoted, depicted, pointed at, acquired, and named—one may sense the elusive quarry whose pursuit continues to drive the continued construction and expression, the unfinished enterprise of meaning itself. Perenially uncaptured, it lies in the future, and is the very element within which the Island subsists and is discovered: ‘it means: it means’—or (beyond any and all situations and their depictions) ‘Whereof one cannot speak, thereof one must remain silent.’ Silent, yet intent on the prize, avid for the hunt. See Charles Avery, The Islanders: An Introduction (London: Parasol Unit/Koenig Books, 2008) and Onomatopeia: The Port. Gilles Deleuze, The Logic of Sense, trans. Mark Lester (London and New York: Continuum, 2001), 13.